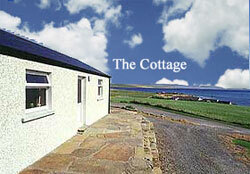 Quoydale farm offers Orkney accommodation on Hoy with some of the most dramatic and spectacular scenery to behold. We offer bed and breakfast accommodation in Quoydale farmhouse, or the rent of a self catering cottage. The bed and breakfast consists of a self-contained double/twin room with en suite facilities, while the Cottage is comprised of two bedrooms (double and twin) shower/toilet and kitchen/living room, and includes all amenities.